On the bench is some of the wood going into the next run of dulcimers. 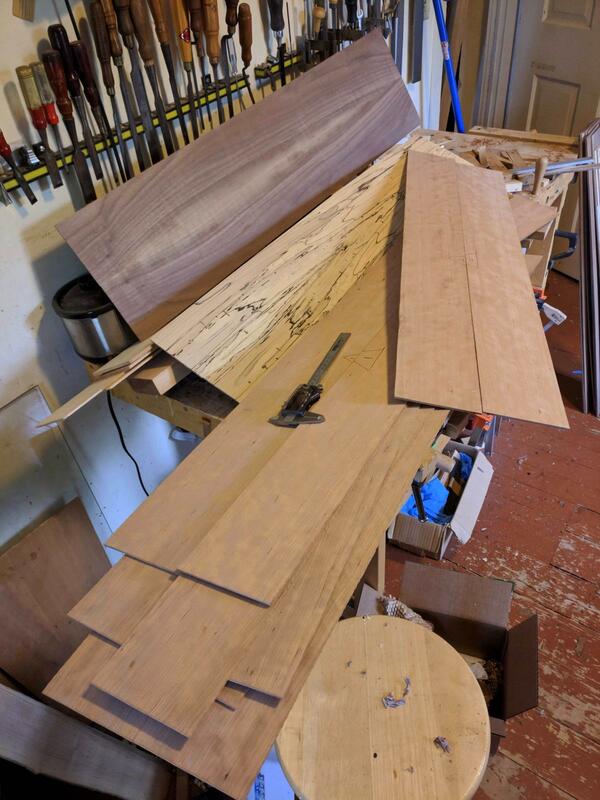 Two dulcimers will be all cherry, one will have walnut for the back and sides and a spruce soundboard, and another will have spalted maple for the back and sides and a spruce soundboard. If you look closely at the photograph you will see a triangle with numbers drawn in pencil on some of the cherry. This is an old trick to mark bookmatched wood so the edges line up as intended. After matching the pieces the way I think they look best I draw the triangle and number. The triangle will only look like a triangle if I put the wood back together in the same orientation. When working with multiple sets sawn from the same stock the number assures the sets are two pieces sawn sequentially. This simple trick has saved me from many headaches! Yes, I live a fascinating life. When I see pictures like this I just want to softly pet the wood. A very good way to help remember what goes with what.